I started my agile life in the Extreme Programming (XP) domain and we did it by the (white) book. That meant stories were on index cards and our story board / sprint backlog was on a pin board. Grandmas recipe - don't mess with it. One of the biggest pitfalls I see in agile adoption is the too early adoption and obsession with "which tool should we use"? My best answer is none. Or at best - run for at least 6 months without an electronic tool before you evaluate them. I just read Why Agile Guys Shun Tools and couldn't agree more. 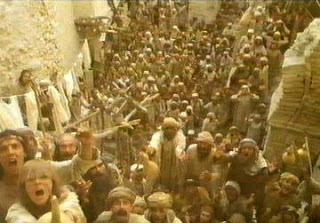 So agile newbies, take note of what the old timers are saying when it comes to tools - "Nooooooooooooo". A recent conversation thread I was involved in was discussing the use of tools vs. physical boards in agile teams and the question was raised - "What if the Product Owner is in a locale with a ten and half hour difference in time zones?" I wanted to ask - why are you trying to break Grandma's recipe of having the customer on-site? Remember the good old days of XP and the on-site customer? Why is the agile community now always trying to break Grandma’s recipe of an on-site customer (or Product Owner)? Why don’t we ship the product owner off shore to be with their team? Cost too high? One of the (many) reasons I am not a fan of off shore development. I was at an agile training course recently and got chatting to a manager about the absurdity of stack ranking – only to find that he liked it! Blew my socks off. Then talking to a few others I find that he was not alone in his views. There are people that still think this is a good idea!?!?!? Okay, you are sensing my position on this. Yes, I think stack ranking is one of the worst practices you can introduce to your company. Unless your goal is to create an atmosphere of dog eat dog competition and kill collaboration. Agile methodologies have their seat in collaboration and communication. I really hope the guy I chatted with will put into practice all that her learned at the course and come to value collaboration over competition. I hear only horror stories from people unfortunate enough to work in forced stack racked companies. If this is you – find yourself another company. Agile companies value passion. If they see passion and the ability to work with a team (i.e. collaboration), they will hire you, because that is rare and hard to find in today’s employment marketplace. UPDATE - Microsoft and Yahoo ditch stack ranking! Automated Acceptance Testing – the next holy war in software development? Recently I have also experienced so many heated debates on the topic of Automated Acceptance Testing that I feel it now qualifies the topic to the ranks of a software holy war topics as the feelings on both sides are so strong and in opposition. I have tried to follow a chronological order in the development of these terms. In the early XP (Extreme Programming) days there evolved two types of testing – unit and functional. Unit tests I do not need to go into as their definition is clear and consistent within the development community. The C2 wiki was/is the birth place of many of the XP terms and concepts so I refer to this site for a definition of the term functional test. Functional Tests are programs or scripts configured to test that packages (groups of clusters of classes) meet external requirements and achieve goals, such as performance. They include screen-driving programs that test GUIs from without. Functional tests scripts were typically written with frameworks that extended xUnit e.g. HttpUnit, DbUnit, JWebUint. In the Functional Testing C2 wiki page referenced above - scroll down the page to see a comment from Kent Beck with the title “Name discussion: functional vs. acceptance test”. This was the birth of the term acceptance test and I will again refer to the C2 wiki site for a definition here. A formal test conducted to determine whether or not a system satisfies its acceptance criteria and to enable the customer to determine whether or not to accept the system. Originally called Functional Tests because each acceptance test tries to test the functionality of a user story. The point of clarity to be made here is the intent of using the word “acceptance” instead of functional. Because the goal of a functional test was to prove via software (scripts or programs), that a story has met it’s acceptance criteria - as defined by the customer. So it seems that the a refinement of functional testing was made such that a given suite of tests purpose was to test only the new functionality provided to a running system by the successful delivery/implementation of a story or stories. As an aside – we did not continue with this approach for very long for a number of reasons outside of the scope of this blog. Referring to the Acceptance Testing wiki page above – you will see where the term Customer Testing came from. As for System Test vs Acceptance Test, these two are essentially the same. There is absolutely no difference in their scope. Only that they are done by different groups of people - usually with vastly different competencies, and with somewhat different vested interest. So – to summarise where we have got to. Functional tests were re-named acceptance tests which were again renamed to Customer Tests which are also known as System tests when run by a testing or deployment team (as opposed to a development team). You wonder why there is confusion?!?!? 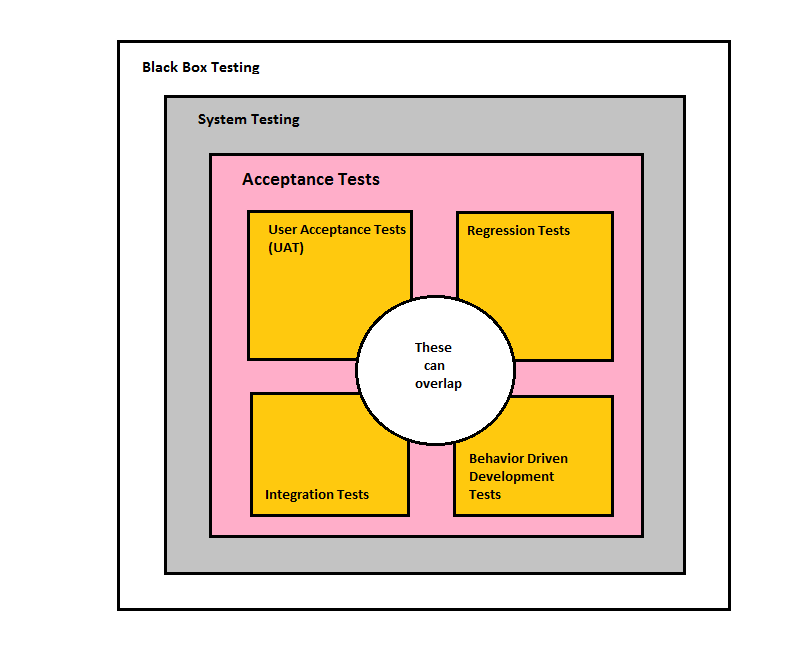 System testing falls within the scope of black box testing, and as such, should require no knowledge of the inner design of the code or logic. As a rule, system testing takes, as its input, all of the "integrated" software components that have successfully passed integration testing and also the software system itself integrated with any applicable hardware system(s). 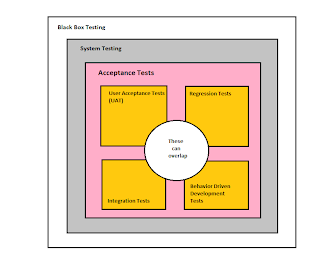 This now introduces two more testing terms – Black Box Testing and Integration testing. When will this end? Testing a system without any knowledge of the inner design of the code or logic. [Integration testing is] validating that the boundaries of a system are functioning properly and will deliver the required results. Specifically, all components within the system should cooperate with each other properly. Integration Testing is performed by Integration Testers or Software Developers. Integration tests typicalll fall in the category of system tests with the express intention of testing the interface points of the system. I want to say something about the term integtration-test as it is used by the Maven build tool. My concern is that people whose only exposure to the term Integration Test is through using Maven may not have a clear understanding of the broader meaning. As part of the maven build life cycle, there is an integration-test phase which is run after your artifact is built. The idea being that after that point you are able to test it from the outside without knowledge of the inner code (i.e. black box process). This would run a separate suite of tests from your unit test suite. However, the name integration-test phase may cause confusion as the suite you run at this point can run black box tests other than just integration. For example, I have used this testing phase to verify that the artifact itself is built correctly after a complex build process. This is essentially testing the build code in the hope that any changes to it that would cause an incorrect artifact to be built (e.g. missing the images folder) would be caught. It treats the build scripts themselves a testable. Regression Testing is testing that a program has not regressed: that is, in a commonly used sense, that the functionality that was working yesterday is still working today. In other words – making sure you did not break anything that was previously working or breaking previous fixed bugs. There are several approaches to this including keeping a suite of all previous acceptance suites (yes they can refactored). In the spirit of TDD – whenever we find a bug, we should write a failing test(s). This may include a system test, particularly when it involves GUI functionality that we are unable to unit test. Once the bug is fixed and this test passes, it should be added to the regression test suite to ensure that we do not re-introduce this particular bug. This is also in the spirit of your tests as documentation as hopefully the new test will read and indicate that was the resolution of a bug and what the bug was. There are strategies as to when these tests should be run but outside the scope of this document. There are Acceptance Test tools that aim to make it simple for the customer to write acceptance tests without (or with minimal) help from a developer or tester. A sub group of these tools include the group that have the tests written in plain text with the aim for the language to be as close to human readable as possible and expose words for domain specific concepts. The language in these text files is referred to as Business Readable-specific language. Some example languages are Gherkin and Selenese. Writing (and running) acceptance tests written in a Business Readable Domain-specific language prior to any other code. BDD Acceptance tests are typically written using the standard agile framework of a User story: "As a [role] I want [feature] so that [benefit]". Acceptance criteria are written in terms of scenarios and implemented as classes: Given [initial context], when [event occurs], then [ensure some outcomes]. Another name for Behavior Driven Development popular with Ruby developers (typically using Rspec and/or Cucumber). Is a subcategory of acceptance testing in as far as it applies only to acceptance tests that relate to testing the user interface. Typically this is the GUI. The ability to be able to test a system using software to run the tests. The opposite of automated testing is manual testing. Writing acceptance tests in a way that they can be run by software. Copyright 2018 Ron Quartel. Simple theme. Powered by Blogger.